Rita Chiarelli, Canada’s most highly acclaimed female roots and blues artist, has just released the soundtrack for her award winning documentary, Music From the Big House, her 9th recording. With a JUNO (a Canadian Grammy) award and 4 subsequent JUNO nominations, she is known across Canada as the “Goddess of the Blues”. Chiarelli is a gifted songwriter and an entertaining performer, but it is her soaring 3 octave voice that sets her apart from her peers, inspires awe and often tears in her audiences, and causes critics to gush. ” a voice so blue it could make the angels weep”… “a voice that can growl at her demons or soar with the angels, a gift for lyric, an ear for melody and the heart to combine them”. The one thing Chiarelli is not; is predictable. Over the past five years she has released Cuore, a recording of traditional Italian folk songs, which won the World Music category at the prestigious Canadian Folk Music Awards; Uptown Goes Downtown Tonight, a highly acclaimed collaboration with the Thunder Bay Symphony Orchestra; and Music From the Big House, a documentary movie filmed in Louisiana, at Angola prison, which premiered in New York and L.A. Her CD Sweet Paradise, heralds a return to Chiarelli’s blues roots, and is her first album of all original tunes since 2001’s JUNO nominated Breakfast at Midnight. As if creating beautiful music wasn’t enough, Rita has entered the film world starring in the critically acclaimed Music From The Big House. She also developed the original concept for the film, one that takes Rita on a pilgrimage to the birthplace of the blues, Louisiana State Maximum Security Penitentiary a.k.a Angola Prison. She never imagined that her love of the blues would lead her to a historic jailhouse performance with inmates serving life sentences. 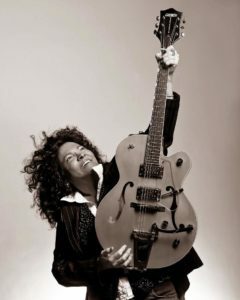 Over the past decade Rita Chiarelli has won every major Canadian blues award, including multiple Maple Blues awards, CBCs Great Canadian Blues Award, Toronto Independent Music Awards, Hamilton Music Awards, Manitoba Blues Society and the Hamilton Blues Society’s Lifetime Achievement Awards. Most recently Rita was awarded the prestigious Maple Blues ‘Blues With A Feeling Award’ for Lifetime Achievement.